You can grind these while grinding Aldor rep in the Oshu'gun Cave. I tend to end up with a twice as many powders from here than any other spot and you get Marks of Kil'jaeden and motes of shadow. Sorry to be a bit slow, but by Oshu'gun Cave do you mean the diamond in the southwest part of Nagrand? You really don't need to activley farm for these in my opinion. Simply doing the nonelite "mastery" quests- and very little else- gave me the requisite 4 research tokens for the Steady Talasite plans on my alt. Doing everything would give me enough for the pants, belt, and possibly the bag. Of course, I'm assuming you're not going for the mount. If you ARE... then, uh, nevermind. I fully agree. Got 4 Samples in 10 kills, which is far better than any of the other mobs I've tried grinding. Ok, maybe someone else can confirm this too since right now its speculation. So, I noticed it when I was leveling in this area but didnt put it together until today after deciding I'd grind for my War Tulbuk. Basically, yesterday I was grinding a little and these were dropping at a good pace. Then today I go to grind more and I don't even think I got more then 10 in an hour. The thing I noticed was yesterday the opposite faction then my own (Alliance) had Halaa. Then today while grinding we (Horde) had Halaa. We'll while I was grinding a raid formed and Alliance finally got Halaa back. So, I started grinding again a hour later and guess what, I get like 10 powder in 5 mins. Conclusion, if the opposite faction then your own has Halaa its time to grind. I think the idea of the powder dropping more when the other faction has control of Halaa is a bit of superstition. I was farming my last 40 powder (2 tokens) for the Dark War Talbuk while a battle was raging at Halaa, which resulted in it swapping from the Horde to the Alliance. I didn't notice any change in the rate at which they were dropping. If you need Mag'har reputation in addition to Oshu'gun Crystal Powder Samples, killing either the ogres (at any location), the Murkblood at Sunspring Post, or the demons in the Oshu'gun crystal is a good idea. Killing the ogres is by far the best way to accomplish gaining Mag'har reputation and powder, though, because the ogres can drop Warbeads, which of course can be turned in for either Consortium or Mag'har reputation. If you do not need Mag'har reputation, however, I advise focusing on something entirely different: the Voidspawn around the Oshu'gun crystal. Many of the things are present. They are spaced out a bit from each other sometimes, so having an epic flying mount is a major benefit to quick kills. They are very easy to kill and do very little damage. They also seem to drop Crystal Powder at a high rate and, even better, they drop Motes of Shadow frequently. An hour of concentrated killing of the Voidspawn can net around 50-60 powders and several Primal Shadows. It seems from WoWHead that there are two versions of this item, a Horde and an Alliance one. If so, I suspect the drop rates are a LOT better than listed here, as the powder will only drop for players of the right faction. I have just personally killed 1600 Nagrand ogres for Mag'har rep, and received powder at a drop rate of 13.0%, approximately double the average drop rate for Ogres given here. Also of note is that you can't have more than 100 of these at any time, even if some are in your bank. I was farming Mag'har rep and collected 17 of these then it just completely stopped. Hours later when I was back at my bank I noted that I had 83 sitting in one of the bank slots. Turned them all in then went back to farming beads for Mag'har and these powder samples started dropping again. In 3.1 this item was changed to be turned in 10 at a time, even though the tool tip still says 20. A very effective and efficient place to farm these at 80 is the Twilight Ridge because of high mob density and fast respawns. You need a flying mount and at 80 the mobs should die easily. Why would you still want to farm these at level 80? Farming these for the mount as a Leatherworker I find that the Talbuk Thornegrazers outside Garadar, the horde base, are the best way to go. I don't need any other rep from the area but it is useful to sell the items you get. Not only do they drop the powder but they can be skinned for Knothide leather which still sells well on the AH. They also drop Talbuk Venison which will also sell as people use it to fast level cooking. Another advantage, if you are horde, is that the base is very close to sell all the vendor trash you will pick up. So some of the posters recommended Twillight Ridge, and since I needed the mounts I decided to try it out. Anyone having some sort of "trouble" with the drop rate of these? EDIT: I had 100 in my bank, and its unique. Stupid me. Iv been grinding these for two days, if your thinking of grinding the halaa mounts. its going to be a good grind ahead. Ive got about 120 powder in the first 2 hours, i think the best place to grind is in any of the ogre camps..
2. they are humanoids so they drop silver. 4. they drop the Obsidian warbeads which can be turned in for 500 with mag'har and 250 with the consortium. its quite simple this is the best place to grrnd.. your be getting rep with places and gold along with thetwo precious mouts at the end. Does this still drop at all? I recently started farming the tokens. I have tried pretty much every location people have said to try. The best one so far (this is at level 85) are the spirit fields near Oshu'gun. 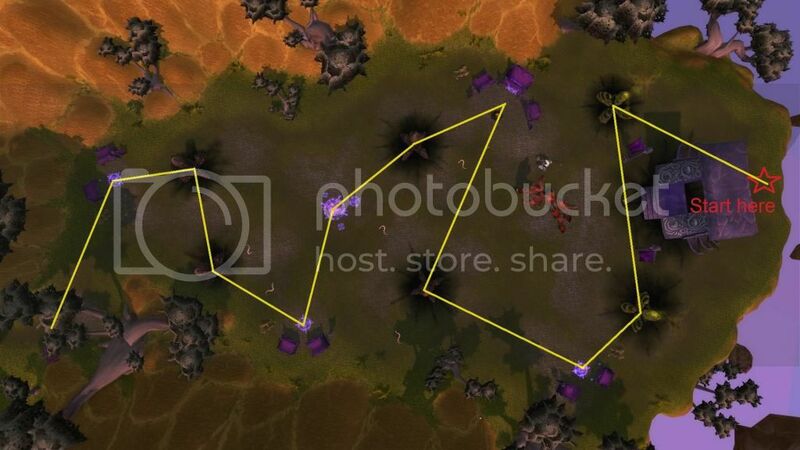 Circle the entire area killing the Vir'anni Archanist's and the Raiders. If you circle and kill everyone you get about 9-10 every time you circle it. By the time you reach the beginning ( where you started ) They will have re-spawned already. It takes about 7 minutes to circle. So that's about 70 per hour which seems pretty good compared to every where else. It's not always going to be exact but it's a guesstimate. :D Have fun farming. Hope this helps. I was after the JC recipie purchasable with the Halaa Research tokens on my level 80 Mage, and found the elementals up by Elemental Plateau not only to have the best drop rate for Oshu'gun Crystal Powder Samples, but obviously for motes as well (if you don't need the motes for crafting recipes, the motes sell for a killing on the AH). There seems to be an inherent lack of understanding in these comments about what a world drop is and how it works. Though it's nice to have these drop rates listed on the article, they are really unreliable and don't mean anything. For instance the spirits listed as the highest drop rate are also probably the mob in Nagrand that is least killed, seeing as they spawn in one very small spot and are usually only killed during a quest that forces you to do so. As a result they will have a higher drop rate. The bottom line is that *EVERY MOB* in Nagrand has *THE EXACT SAME* chance to drop this powder. Thus the logical productive choice is to farm it somewhere with a high concentration of mobs; more kills in less time gets better results. That being said, I do feel like the drop rate in general has lessened dramatically. When I farmed these a year ago I found I got one every 7-10 mobs, and now I am going 20-30 kills without seeing one. Roland1969 8 days ago (Patch 4.3.4) "As a result they will have a higher drop rate." "The bottom line is that *EVERY MOB* in Nagrand has *THE EXACT SAME* chance to drop this powder." Which is it? Downgrade. Read the whole post before downrating someone. The ghost have a higher drop rate because few people kill them, therefore even fewer of those people update to WoWhead. "As a result they will have a higher drop rate" on WoWhead, because the numbers are misrepresented. I can attest to the Ancestral Grounds being a good farming spot. I had my battle tokens for the mounts, but still needed research tokens to purchase them. I went on this page and only looked briefly at the top, so I headed to Sunspring Post. The mobs are humanoids so they drop silver and often netherweave cloth. It's a tight area so it is easy and fast to make loops. Important: They respawn very quickly, so even though you are making the rounds one-shotting everything, you never have any down time waiting for more mobs. Obviously I had my peaks and troughs with the powder drops due to RNG, but overall it was a pretty nicely consistent rate, and for the reasons stated above it was quick and easy. Put on some music or pull up a video, get to farming, and soon you will be sporting two new mounts. If you want to farm these in a relaxing way and don't need these, go to Twilight Ridge which is all the way to the west. The mobs spawn in clusters of 4-8 mobs and when you are done killing them you have to wait for respawns (3-5 min), which in my opinion is a good thing. I did test most of the other popular places and found this the fastest powder/hour, even with the wait time. 261G from grey items and 101.5G from turning in the powder. Here is the route I found to be the most efficient. I was a bit unsure at first, but the twilight serpents definitely also drop powder so kill them too. Not much of a need to farm this anymore, as Mysteries of Lok-rath will pop up in your garrison sooner or later. "You may turn 10 of these items in to Chief Researcher Amereldine at Halaa if the Horde have control of the base."